If you are looking for blue skies and loads of fun, then Orlando Florida is a great choice. Orlando is named The City Beautiful and it gets this name for a reason. It is one of the most beautiful cities in the south, and its central location makes it a great choice. MovingQuote.org has put together this list of tips and information that will make your move to Orlando, Florida a lot easier. The city of Orlando sits on 110 square miles of prime Florida real estate. Out of this 110 square miles, 8 square miles of it is water. Orlando has quite a large population. 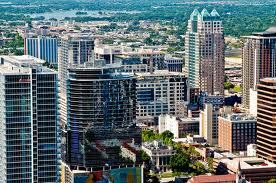 Currently there are around 240,000 people that call the city of Orlando home. Orlando is more than just the city of Orlando. There are dozens of smaller neighboring communities and cities all around Orlando. This area is known as The Greater Orlando Metropolitan Area, and just over two million people live there. Many people that move to Orlando from northern cities have a difficult time getting used to the heat that is found in Orlando. There are four seasons in Orlando, but for most of the year it gets hot. It is not uncommon for every day during the Summer to reach high temperatures in the upper 90s, and this is not your typical dry type of heat that most people are used to dealing with. The heat in Orlando is a wet heat. The humidity is often at 100% every day. This is what makes the heat of Orlando so unmanageable for people that are not used to it, but there are plenty of ways to escape the heat. Orlando’s central location makes it easy to drive to one of the many fabulous beaches that lines the state’s coast. Orlando residents can take a short 40-50 minute drive to the East and relax in the cool blue waters of the Atlantic Ocean. This is a very popular pastime for Orlando residents, and it is not unusual for the beaches to be packed tighter than a can of sardines in the Summer months. Winters are very mild. Temperatures rarely dip below 30 degrees, and if you want snow, then you will need to drive further North to find it. You will find that there are plenty of great places to spend your day in Orlando. Just outside of the city are three major theme parks. You can spend some time at Walt Disney World, Sea-World, or Universal Studios. These attractions pull in millions of people each and every year, and they are just one of the reasons that Orlando Florida has become the most popular tourist city in the entire United States. More people visit Orlando in a given year than any other city in the United States, and many visitors quickly become permanent residents once they arrive. Orlando is a great place to live. If you are thinking about moving to Orlando there has never been a better time than now.